Witness the birth of Nate Grey as he ascends to godhood in the pages of Uncanny X-Men! Nate Grey's been making all sorts of waves in the recently relaunched UNCANNY X-MEN by writers Ed Brisson, Matthew Rosenberg, and Kelly Thompson. The mutant mind master from another reality seems dead-set on creating his Horsemen of Salvation, regardless of how anyone else – including the Horsemen themselves – feels about it. To understand his motives, it makes sense to look back at his origins which go all way back to the 1995 Age of Apocalypse event. At that time, Professor X's estranged and deranged son Legion traveled back in time to kill Magneto, but accidentally offed his own dad, which set up a new timeline wherein Apocalypse took over. All of the ongoing X-titles stopped at that time to be replaced by new ones. 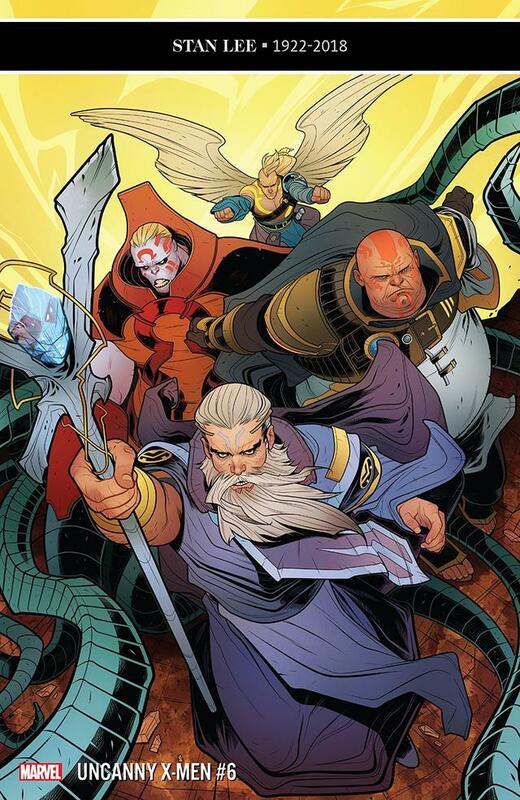 CABLE gave way to X-MAN, a title by Jeph Loeb and Steve Skroce. 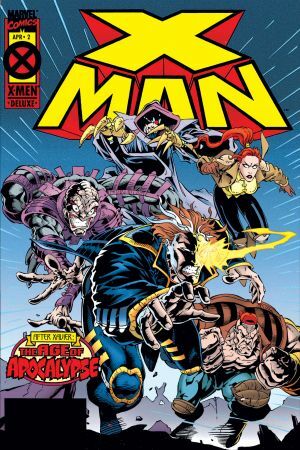 The story kicked off with the young mutant performing in a traveling theater company made up of mutants collectively known as the Outcasts lead by Forge, who also performed covert missions to help save lives whenever possible. However, Nate wanted to do even more with his massive mental powers. Unfortunately for him, the use of said powers, tipped off Apocalypse's minion Shadow King to Grey's presence. Upon hearing of the mutant, Apocalypse ordered Domino to put together a group of hunters to either bring Nate in or kill him. At the same time, Apocalypse's main scientist Mr. Sinister left his boss' employ and presented himself to the Outcasts as Essex. Secretly pulling Nate's strings and pushing his buttons, the newcomer led the group to a facility that made food for Alpha Class Mutants out of human bone marrow. Nate couldn't stand to see it and went crazy on the place, but he and his group barely escaped. As the Outcasts healed up at a nearby farmhouse, Essex made his true nature known just before Domino, Grizzly and Caliban appeared. Grey managed to defeat them, but the losses were great. However, the death of Forge at the hands of Sinister nearly sent him over the edge. Grey calmed down long enough to see his own origins by way of Sinister's thoughts. The geneticist created Nate Grey from DNA stolen from Cyclops and Jean Grey to become a weapon he could use against Apocalypse. With his former master's shift in focus to utter death and destruction instead of the evolution of mutantkind, Sinister saw that time as now. After defeating Sinister, Nate decided to follow Forge's advice and find mutant resistance leader Magneto, leader of the X-Men. At that moment, he'd been captured by Apocalypse' minions and taken to Manhattan, the ruler's seat of power. X-Man broke in and helped stop the culling of the assembled mutants in the pens below before running into his parents and then flying off to fight Apocalypse. The battle itself takes place in X-MEN: OMEGA by Scott Lobdell, Mark Waid and Roger Cruz. As the various X-Teams converged on Manhattan, Nate flew in and distracted Apocalypse long enough for Magneto to reunite with his team. While he took on Holocaust, the X-Men used the M'Kraan Crystal to send Bishop back to the moment when Legion killed Professor X and stop him, thus wiping out the entire Age of Apocalypse reality... almost. While battling Holocaust, Nate plunged a piece of the Crystal into his opponent. As a result, they both made their way to the rejuvenated Marvel Universe! 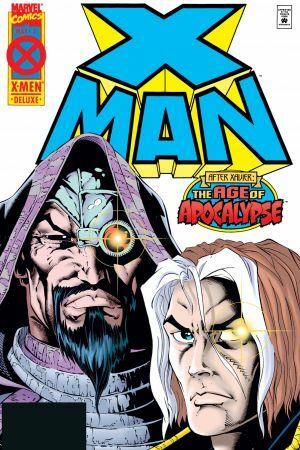 Unlike all of the other Age of Apocalypse titles, X-MAN continued long after the event came to its conclusion even as CABLE continued on with its previous numbering. 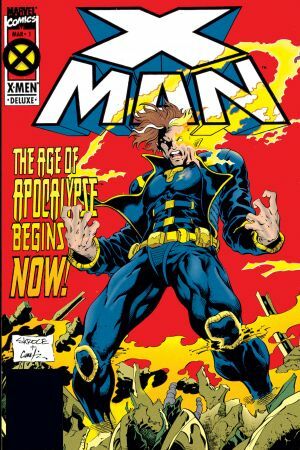 Over the years, Nate Grey came to become an important part of the mutant landscape. He didn't appear a lot after his series ended in 2001, but did pop up in DARK X-MEN as well as NEW MUTANTS #25-50 starting in 2011.